The debugger lets you control the execution of your program by setting breakpoints, suspending executed programs, stepping through your code, and examining the contents of variables. Click the Run > Debug Configurations... menu option. 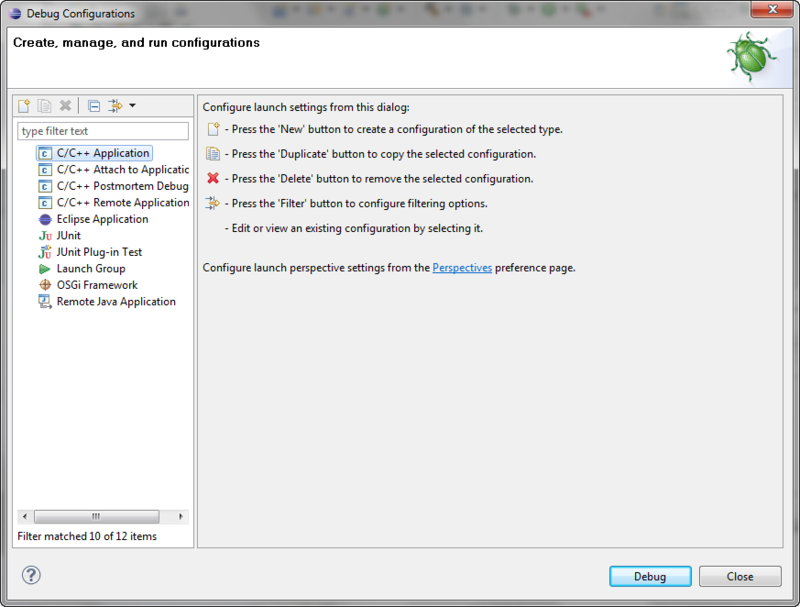 The Debug Configurations dialog opens. 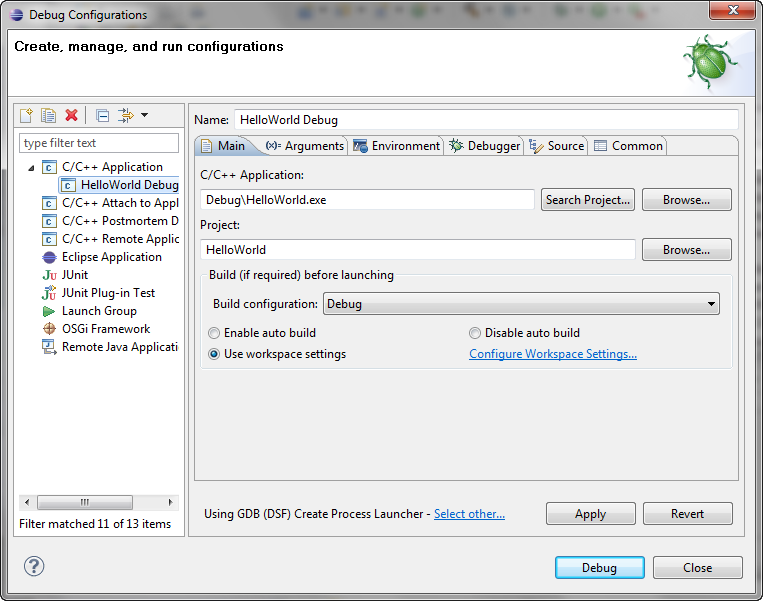 Double-click C/C++ Application to create a new launch configuration. If a project is selected in the Project Explorer view the following data is automatically entered, take a moment to verify its accuracy or change as needed. In the Name edit box, type the project name, like Hello World. You can now select this debug launch configuration by name the next time that you debug this project. In the C/C++ Application edit box, type the name of the executable if its not already entered. If not, click the Search Project button to locate the executable in the project. In the Project edit box, type or choose your project, e.g. HelloWorld. NOTE If you see the error "[Debugger]: No debugger available", select the Debugger tab and choose a valid debugger for your platform (e.g. gdb/mi). The Debug perspective appears with the helloworld.exe application window open. The C/C++ editor repositions in the perspective. NOTE: If you see the error "Can't find source file" in the editor view, use the Locate File button to locate your source file. You'll see a blue circle ( ) there indicating the breakpoint is set. Or, you can use the Resume button ( ) on the toolbar of the Debug view . When prompted, in the Console view, type a value other than 'm', and press Enter. The breakpoint will be hit. In the Variables view, verify that the variable is not 'm'. When prompted, again type a value other than 'm' in the Console view, and press Enter. In the Variables view, right-click the input variable, and select Change Value... and type 'm' between the single quotes and hit OK. The output in the helloworld.exe application window is: "You just entered m, you need to enter m to exit." The application terminates and the debug session ends. The Debug perspective remains open. To learn more about debugging, see the related debug conceptual topics.